On October 13th and 14th, we gathered at Big Basin Vineyards for two nights of stories and delicious feasting! The Feast was exploration of what it means to deepen into a place. To root down. To get grounded. And to feel through all the layers of the terrior. We called it Rooted. The tables were placed at the root zone of the Estate vineyard block. They were at the place of richness and depth—so we dined at the level of the roots, themselves. And here, we remembered that wine itself allows us to travel through time. Wine connects you with vintages of years past—you can taste the results of weather, microflora, and of course the unique interests of the wine maker as well. It was an honor to work with Big Basin Vineyards on this event, and to have owner/head wine maker Bradley Brown tell tales of each wine pairing along with each dish. And with each dish, we adventurously explored the history of Santa Cruz County. We discovered a time when the apple was king, Pismo clams thrived, and strawberries were rare. We based this lavish six-course meal on the Santa Cruz Museum of Art and History's newest publication, Harvesting our Heritage. Curated Feast founder and storyteller Liz Birnbaum is one of the four authors of that book. Creative powerhouse Dare Arowe of The Kitchen at Discretion, who along with Liz Birnbaum of The Curated Feast was featured as one of Santa Cruz's Six Culinary Masterminds this year (Dare is in the article along with Liz Birnbaum of Curated Feast—that's how they met!) earlier this year. Special thanks also go to our incredible event manager Heather Griffith, our always amazing-florist Carra Duggan of Flowers by Carra, and to our wonderful pantry sponsor, Whole Foods Santa Cruz! For this Feast, we gathered on Memory Lane (yes, literally) for a unique dining experience among the vines and in the crisp Fall air. As we dined, the stars came out above us and we were warmed by the glow of the fire. We opened this feast by acknowledging that while we have the great privilege of gathering and exploring our own roots, there are simultaneously so many communities that have been uprooted and cannot set roots—we thought of Texas, Las Vegas, Puerto Rico, the North Bay, and so many more. "The adjacent mountains were wild and rugged, the canyons deep and dark with the shadows of the forest. Coyotes broke the stillness with their dismal howls, and herds of dear slaked their thirst in the clear waters of the San Lorenzo. Grizzly bears were numerous, prowling about in herds, like hogs on a farm." But of course where the Spanish saw wildness, there was actually a community here. There were nearly 30 contiguous villages in the region. The members of these villages were united by shared cultural practices. The Spanish called them the Costeños, but today we know them as the Ohlone, Awaswas, or the Amah Mutsun. 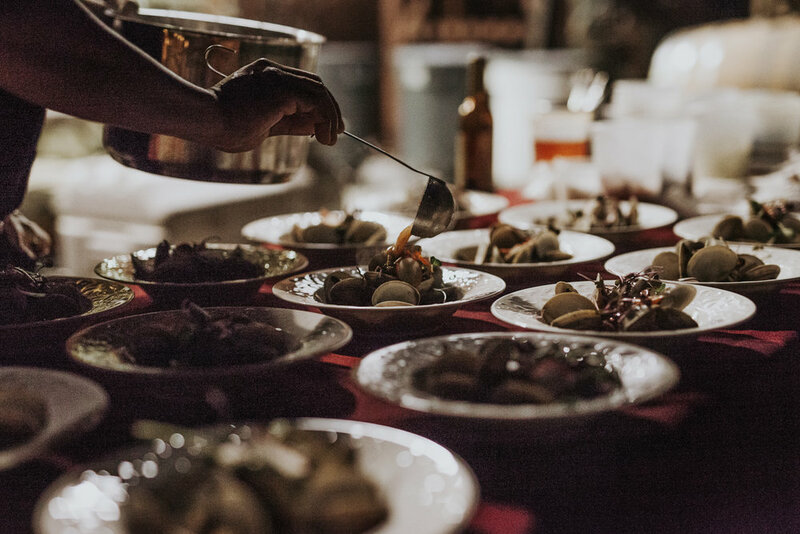 For the first course, we thought back to a recent talk at the Santa Cruz Museum of Art and History which revealed through archaeological evidence—through the remains of fire pits—that the re were an abundance of cultivated chestnuts in this region. This set us off on the journey of or first course, where we contrasted the chestnut with the potato, which first put Santa Cruz on the map as an agricultural hub. Prospecting farmers were drawn to Santa Cruz because of the accolades it received for its potatoes. And while some prospecting farmers came to California for the Gold Rush, prospecting farmers came to Santa Cruz for a Spud Rush. At the New York World's Fair, they raved "Santa Cruz produces "the finest potatoes ever known." However, with so many farmers flooding the market, the prices soon fell, and many prospecting farmers got burned. So in this first course we have blended the chestnut with another North American native food: squash. We topped it with the crispy bits of what was left of the spud rush potato. For the second course, we had a foraged salad. With that dish, we explored the line between foraging and cultivation. How we can encourage certain roots to set and harvest their fruits over time. We explored the stories of the locally famous olallieberry, and one half of its genetic parent, the loganberry. This berry is named after local Judge John H. Logan, who set about the task of creating a better blackberry in the 1880s. Over seasons, he planted and tended adjacent patches—some native wild blackberries, others were popular varieties of the time. After a couple seasons, one particular cane caught his eye. It was the unintended cross between the wild blackberry and the red antwerp raspberry. He donated its use for the public domain and called it the loganberry. It eventually became part of olallie fame! And speaking of fame, we now reach the neighborhood of Live Oak, which was pitched as a midwestern farmers' retirement community and a place to live out the good life while raising chickens. And when a community of chicken houses exists, you've got to have an egg laying contest. One lady, Columbia Belle, laid 324 eggs in one year! So this salad spans our history—its base in foraging, its locally bred berries form a dressing, and its record-busting eggs lay atop. In this course, we encounter themes of abundance and temperance. First, abundance. From the 1860s to the 19-teens, clamming would make it to the society column of local papers. They would cite hundreds of daily beachgoers clamming and then hosting clambake feasts on the Santa Cruz beaches. And as clamming and Santa Cruz tourism both gained steam, the abundant clam harvest was a featured attraction. With hundreds of daily beachgoers, though, this was not a great time to be a clam. And in 1918 the concern of prohibition started to make the paper too—and the Santa Cruz Evening News wrote "did you ever hear of a beerless clambake?" And indeed not! Santa Cruz was a place of hops cultivation as well, and it had a thriving local saloon scene—but not everyone enjoyed the revelry. The temperance movement, and especially the women's christian temperance movement, were highly influential groups. They set up a hall right across from a downtown saloon, and advocated for a shift in the tide of how people related to alcohol. And clams, too, were swept up in a similar tide of temperance. Their numbers began to dwindle, and there were regulations placed on how many people could harvest. So while both clams and beer lost steam, we have re-steamed them for you in this dish. This next course is a take on the theme of war and peace. The two stories are of artichokes and dry-farmed tomatoes. The element of war comes from a spiny thistle—the artichoke. In the early 1930s, local press ran the bold headline "THE ARTICHOKE WAR". What had happened was that the Union Pacific Produce Company had set themselves up as the only buyer/seller of local artichokes, thus establishing a monopoly. They also used mobster-esque tactics to maintain control of the artichokes—raising the prices for market and vastly underpaying farmers. This racketeering caught hold in the national press when in 1935 Mayor Laguardia of New York stood up on a market to denounce artichokes from California. He said until the racketeering was stopped, and those responsible were brought to justice, his city wouldn't buy any more California artichokes. And in contrast to that war, we'll jump to a peacetime activity, where hippie farmers grew tomatoes on a commune to feed the Dead. The Grateful Dead—of course! At the Molino Creek farming Collective in Davenport, California, they grew a special type of tomato. They didn't irrigate once the tomatoes were in the field—but mostly that was because they didn't have the infrastructure. These tomatoes were smaller than most 1980s customers were used to—they were too small to cover a hamburger. So they called them saladettes. They began to be a huge hit because they were so flavorful and unique. Someone at the farming collective knew The Grateful Dead's tour manager, so they introduced Jerry Garcia to the tomatoes, and he became a fan. In fact, at one of their board meetings(and yes, TGD had board meetings) the accountant asked why they were paying so much for tomatoes to be shipped to them around on tour. Jerry simply asked — have you ever tasted them? In this course we look at apples and sugar beets. The story of the apple in Santa Cruz is one of luck starting with one little moth. When the Santa Clara Valley's apple crop was decimated by the brown coddling moth in the 1870s, the Pajaro Valley of Santa Cruz was given the opportunity to dominate the apple market...and by the 1880s, they did. They were even shipping apples to Australia and England at that time. So Sanat Cruz became known for its apples and some even got the coveted designation "California Fancy." And of course we still have apples here to this day. But in contrast to the apple crop which has sustained some production locally, the sugar beet was once the focus of a huge industry in Watsonville, is is now all but faded from memory. Sugar beets tell the tale of industry tycoon Klaus Spreckles who created factories and jobs with promises of longevity and growth. But even after Watsonville came together and donated the land to Spreckles to start his factories, he still moved on within a decade to the eponymous town of Spreckles, California and mandated than any employees of his live in that town as well. And though he may have been the original reason for the phrase "sugar daddy", he sure didn't stick around... but the memory still lingers because he the Watsonville city seal has the sugar beet on its design to this day. Each course explored crops which shaped Santa Cruz County's local food and agricultural history. The stories were performed before each course by Liz Birnbaum. Full Gallery Below. Most photos are by Meghan Smolka Photography, with some additions from Liz Birnbaum.